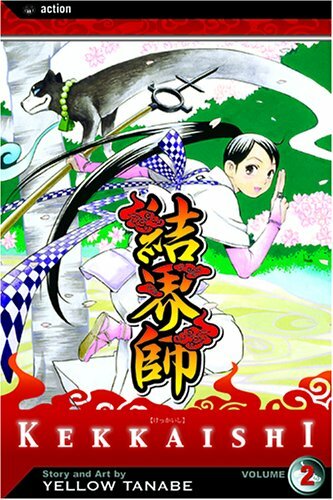 Like most early volumes in a series, volume 2 of Kekkaishi is a lot of background material. While background volumes often drag, this volume had enough plot and action that you hardly noticed the substantial amount of background information. A mysterious girl shows up at Tokine's house saying she was sent to stay with them by the shadow organization. Tokine's grandmother is surprised but admits her into the house. Turns out that Yomi is a demon tamer. The real reason she's here is to take her demon Yoki to Karasumori, where Yoki can grow into a powerful and dangerous demon. Yomi is willing to do anything to help Yoki the demon gain power, including killing Tokine and Yoshimori when they get in her way. Yomi particularly likes to taunt Tokine about her dead father, accusing him of being weak. What I liked about this volume is that there's an undercurrent of love in many of the characters. Yomi truly loves her demon Yoki. They've been friends for years. Even Yoki the demon has some affection for Yomi. It shows that demons are not simply devilish creatures. I doubt they'll be the heroes of this series, but the series isn't simply black and white. Yoshimori is a kindhearted boy. Brave and willing to kill, but not without thought. He recognizes that some demons or demon tamer may not be worthy of death even if they're bad. In contrast, when the shadow organization shows up to help destroy the demon, they're cold-hearted killers. So the good guys may not be entirely good. I still can't say that I'm in love with Kekkaishi. But I do like the thought that's gone into this series and the layered characters. It's hard for me, personally, to fall in love with this particular type of manga because I'm not overly interested in the demon fighting. It is a good manga, but like you, not in love. Nice that even though you get a lot of background information in this one, there's still a strong plotline that makes the info dump not as noticeable:) Lovely review Alison! I haven't read this series. I think I'm going to give it a try. I have to admit that until quite recently Mangas were sitting tucked away in a dark corner. Now that I've discovered them, my son threatens to hide them since I'm always in his room looking at what he has bought. Loved your take on this one - will have to ask if son has heard of this one too. I like a series where the characters are multilayered. How boring would it be if all the characters were completely good or bad? Like you, I like background information so that I can get a better grasp on the story/character. Glad this one doesn't just dump info and drag the story. Yes grey areas I love my characters to be at least have some complexity otherwise the story is just dull and villains predictable. Glad to hear you are liking the story, I need to make sure to pick this one up soon. My Manga Monday isn't a manga at all xD.